Special issue with exclusive contributions by our board members. This paper investigates how exposure to sunshine affects the suicide rate in Japan, especially in relation to economic variables. Using prefecturebased data on socioeconomic variables for the years 1993–2009, the paper confirms existing research in finding a significant correlation between suicides and unemployment, for both men and women. The interaction between sunshine and unemployment is also significant, and further analysis reveals that unemployment is not an important factor for suicide in high-sunshine prefectures, whereas in low-sunshine areas the effect of unemployment on the suicide rate rises. The divorce rate is highly significant and positive for men, but significant and negative for women, suggesting that many Japanese women consider divorce liberating. Current suicide research in Japan with its strong emphasis on economic variables may benefit from an inclusion of measures of general well-being. Collective memory studies generally focus on national commemorations of heroes and heroic events that unify nations. Recent research also examines the contribution of negative collective memories that vilify individuals and organizations, and collective memories that remain in contention. 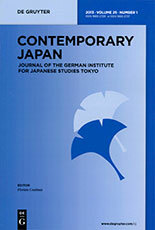 This study examines the contending collective memories that surround the protest cycle of the late 1960s to early 1970s Japan through analysis of three key events: the First Haneda Incident of 8 October 1967; the climactic battle between Zenkyōtō students and riot police on the Tokyo University campus 17–18 January 1969; and the Asama Sansō siege and Rengō Sekigun purge of early 1972. A heavily negative view of the entire period has solidified in public collective memory through commemorative media presentations and films that recycle visual images of the protests into a blur of senseless violence without explanation of its causes. This overwhelmingly negative collective memory reinforces the dominant values of social order while suppressing the underlying issues that sparked the protests. Those who experienced the period as student participants also view the outcomes as negative, but they keep alive more positive memories of their youthful participation in protest events and the issues that motivated them, through nostalgic commemorations and media that circulate within a New Left subculture. This paper analyzes a language ideological debate in which the status and utility of the Ryukyuan languages were discussed. One fraction supported the continuous oppression of the Ryukyuan languages as an inevitable means for Standard Japanese language spread in the Ryukyus. Their critics called for calmer judgment, pointing out the cultural value of the Ryukyuan languages. In the course of the debate, opposing visions of future linguistic orders in the Ryukyus emerged. It was the vision of those calling for Ryukyuan language oppression which turned into reality. The reason for such sociolinguistic change is rooted in power inequalities between the Japanese mainland and the Ryukyu Islands. Today, all Ryukyuan languages are set to become extinct by 2050 if no counter-action is taken. The language ideological notions connected to the Ryukyuan languages in the course of Japan’s social and linguistic modernization and the reproduction of these arguments by one fraction of the debate constitute the obstacles that all those seeking Ryukyuan language revitalization must surmount. They may find useful points of departure for doing so in the arguments of the critics. However, the debate is also of interest for students of linguistics and the social sciences, since their disciplines do not emerge as “neutral” in the course of debate. Rather, they constitute central pillars in the modernist quest for homogeneity and monolingualism in a linguistically diverse state. In international comparison, the level and the performance sensitivity of executive pay in Japan are low. Both characteristics can be related to the prevalence of internal labor markets. These not only select the ones who will be promoted to the top, but also strongly influence the way by which the level of executive pay is determined. Last but not least, life-long company careers provide for forms of control that can function as a substitute for explicit incentives built into remuneration packages. In postmodern society, the field of consumption has replaced the world of production as the main arena in which dominant stereotypes of masculinity and femininity are communicated and reinforced. Previous research findings suggest that deference to male authority, homosociality, hierarchical junior–senior relationships, conformity and control, and the appreciation of pain and violence are characteristic elements which exaggerate masculine traits and devaluate feminine ones in sports in Japan. My own experiences with rock climbers in Western Japan questions the conventional wisdom of the preponderance of such “masculinity rites” – which overwhelmingly have been observed in highly formalized, competitive, and organized settings. Confronting traditional, mainstream sports with less explored subcultural modes of alternative sport involvement, such as surfing, skateboarding, or climbing, this article explores to what degree hegemonic masculinity has also shaped ideas and ideals of maleness within lifestyle sport and whether these subcultural spaces actually offer the opportunity for the experience of alternative modes of masculinity.